Sgt. Tim York with the state fire marshal's office sifts through debris of a four bay garage on Pierce Street In Lewiston after Friday night's fire. Three buildings, two on Pierce Street and one on Bartlett Street, were burned and a fourth on Pierce Street sustained major smoke and water damage. 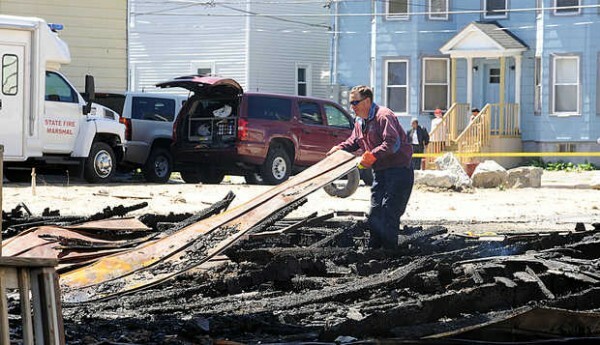 LEWISTON, Maine — A 12-year-old boy was charged Saturday with setting a fire late Friday that destroyed three apartment buildings, leaving 105 people homeless and doing an estimated $1 million in damage, state police said. The boy was charged with four counts of arson. He is in custody at the Long Creek Youth Development Center pending his first court date on Monday or Tuesday, state police said. The Friday fire was reported about 10:30 p.m. in a vacant garage adjacent to a condemned apartment on Pierce Street and quickly spread. Within minutes, the apartment house itself was burning and flames were jumping to nearby tenements, including a building on Pierce Street. The arrest was the second in two days of a 12-year-old boy charged with arson in connection with a devastating fire in Lewiston. Lewiston police charged another 12-year-old with arson on Thursday in connection with a fire that destroyed more property earlier in the week. Lewiston police said no connection appears to link the two 12-year-olds, but that more youths might face arrest as the investigations continue. The Sun Journal contributed to this report.